I first discovered my love for homemade chicken pot pie last summer and I've been mildly obsessed ever since. I constantly looking for new ways to make old recipes exciting and this was a no brainer - swap out the individual ramekins and make it a casserole - done and done. All the same veggie filled chicken yumminess, but without the hassle of cleaning separate baking dishes. A love whipping this dish up on a Monday night and enjoying leftovers for the next couple of days. There's something about chicken pot pie that is so comforting and makes your day or week instantly better. 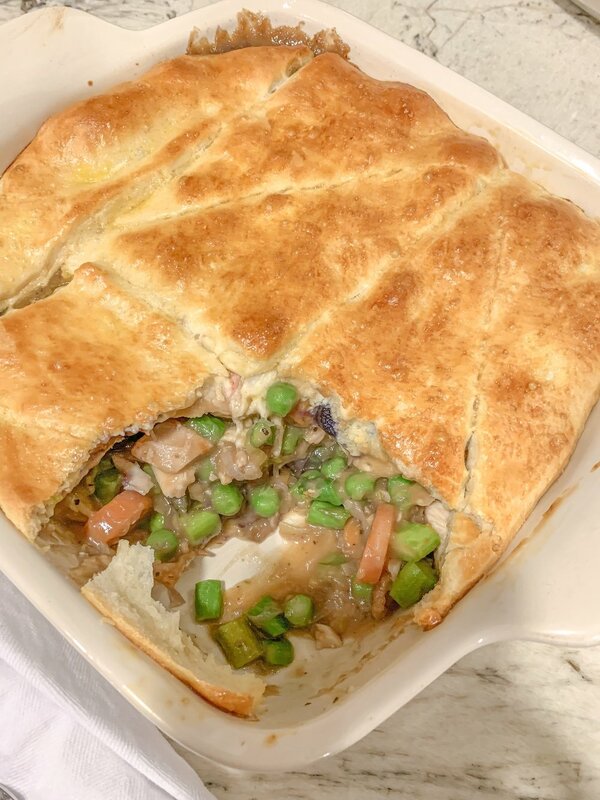 Personally, I love this recipe because of how many veggies there are, some pot pie recipes end up with way too much buttery filling that you feel sick. Not the case with thus version, all the different veggies keep you feeling full without being stuffed. What are some of your favorite pot pie filling options? Preheat oven to 375 degrees F. Spray a 9x11 glass baking dish with nonstick spray. To make the filling, melt 2 tablespoons butter in a large pot over medium high heat. Add leeks and carrots and cook, stirring frequently, until the carrots begin to soften, about 5 minutes. Add asparagus and cook, while stirring, until the vegetables are tender-crisp, about 5 minutes more. Remove from heat; stir in peas and chicken. To make the sauce, melt remaining 6 tablespoons butter in a large saucepan. Add garlic and cook, stirring frequently, until fragrant, about 1 minute. Whisk in flour until lightly browned, about 1-2 minutes. Gradually whisk in chicken stock and cook, whisking constantly, until the sauce has begun to thicken, about 5 minutes; season with salt and pepper, to taste. Add sauce to the chicken-vegetable filling and gently toss to combine and transfer to the glass baking pan. Top with croissant dough, I opted to cut the dough into 8 small circles. Brush each crust with the beaten egg. Place into oven and bake until the crust is golden brown, about 20 minutes. Let cool 5 minutes before serving.